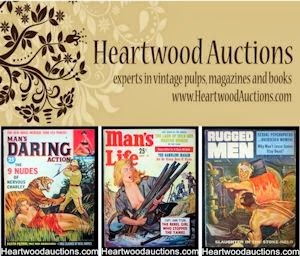 In my New Year’s Eve post last year, I showed some examples of cover paintings that appeared on the covers of two different men’s adventure magazines. I thought about that post this morning as I was transcribing a recent phone interview I did with Gil Cohen — one of the top artists who created the artwork for those magazines. Today, Cohen is renowned for his aviation art. In addition to being sold by art galleries in the U.S. and the U.K., his paintings of historic planes, pilots and crews in wartime and at rest are included in many private and public collections, such as those of the Mighty Eighth Air Force Museum in Savannah, Georgia, the National Guard Image Gallery and the Pentagon. They’re also the focus of the excellent book Gil Cohen: Aviation Artist. 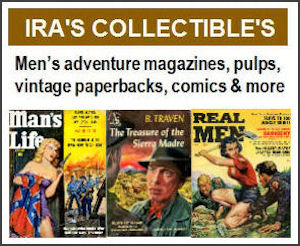 But from the mid-1950s to the mid-1970s, before he became the country’s premier aviation artist, Cohen did hundreds of cover paintings and interior illustrations for men’s adventure magazines. In the weeks ahead, I’ll be doing a series of posts that feature Gil’s artwork and excerpts from my interview with him. He graciously answered many questions I had about his days as a men’s adventure artist. Among other things, he explained how second uses of an artist’s paintings and illustrations were typically dealt with. 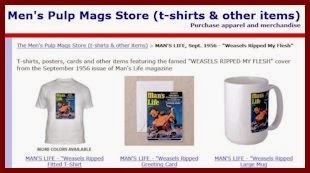 One example of a second use I had noticed involves a cool Gil Cohen painting that was first used on the cover of the May 1967 issue of Male magazine. It goes with a “Book Bonus” story inside titled “The Ravishers,” written by James Hadley Chase. 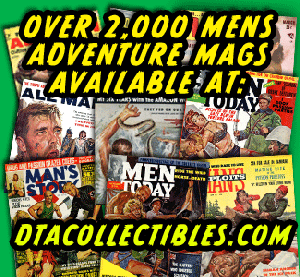 The original Gil Cohen cover painting used on the May ‘67 issue of Male happens to be owned by my friend Rich Oberg, the world’s foremost expert on and collector of men’s adventure magazine art. During the course of an email exchange with Rich, I found out that a cropped version of that painting was also used on the cover of the May 1968 issue of True Action magazine. So, when I interviewed Gil, I asked him if he normally received a second payment when his work was used twice like that. He explained that he and other artists typically sold first reproduction rights for a painting or illustration and usually did get another payment if their work was reused. 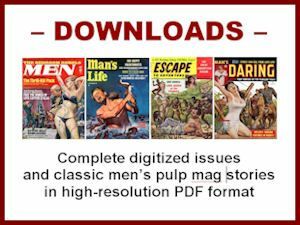 At least, they did if it was reused by a reputable company like Magazine Management, which published Male, True Action, Stag, Action for Men, For Men Only and many other classic men’s adventure mags. “Of course, I did more work for Magazine Management than any other men’s adventure magazine publisher,” Gil told me. “I had a stamp I used for their purchase orders that said ‘For first reproduction rights only.’ If they wanted to reproduce the painting again, as they sometimes did, I got another fee. I greatly appreciate the time Gil took to talk with me and I’ll relay some more of the facts and anecdotes he told me soon. In the meantime, have Happy New Year! Stay safe and avoid seeing double — unless it’s on the covers of men’s adventure magazines.